The forecast for clearing air did not prove true. Was very smoky (actually worse) on Saturday and the webcams show plenty of smoke on Sunday morning. Just noted that there are now (Sunday 8/12/2018) several fires during in the park. Here's an article from KRTV. We are a 100% over here on Sunday than it has been for the last week, light breeze in the mid 70's today and no smoke visible from the house here. I drove over to the East side Saturday. I hiked up to the Hidden Lake overlook. Smoke everywhere as far as you could see. That's the bad news. The good news is that it appears we'll get some decent rainfall tonight through Monday. We got a little rain overnight here in Whitefish. Here are two forecast discussions. The first is for the West side area; the second is for the East Side. accumulations likely near 8000 feet. change with each model run keeping confidence low. mountains, generally above 5500 feet. timeframe is precipitation amounts/coverage/type and temperatures. today, with lingering effects into the morning hours on Tuesday. I wonder if those who began long backpacks are prepared for this weather coming tonight? Weather like this is not rare for this time of year. will become more widespread overnight through Monday morning. with the higher amounts expected across the higher terrain. expected into the following week as well. Mountain Front above 6000 Feet. * WHEN...From midnight tonight to noon MDT Monday. make touring and backcountry recreation difficult. I see rain and SNOW on today's (8/27) webcams from the park. with localized amounts over 12 inches, are expected. * WHEN...From 6 AM Saturday to 3 PM MDT Sunday. mountain passes. Expect reduced visibilities. Some major snow coming early. inches at Marias Pass, are expected. * WHEN...From 3 AM Tuesday to noon MDT Wednesday. I know Calgary isn’t the Park, but the same weather system is moving through, and we woke up to 12 inches of snow this morning and it should continue to snow for the rest of the day. We did not have much of a Fall this year. We went from smoke to cold, and now it seems to officially be winter. We got some snow in West Glacier. Gotta work some today but will try for some pics later in the day. * WHEN...From 2 PM this afternoon to 11 AM MST Wednesday. Lake, Marias Pass, and Polebridge. Did this storm ever materialize, or did it pull what all storms headed for MN seem to do? BTW, the webcams seem to indicate the later. I don't think anywhere up here got much snow from the last system moving through. We had 3" forecast here and got rain on that last go round. There's barely any snow here in the valley. An inch or so on the ground outside my window but it faces due north. Never gets any direct sun. I seem to have read that above 6-7000ft the snowpack is near "normal". Skiing is limited to the north side of Big Mountain. The next few days don't look good for snow either. The East Side is almost always colder, and that's been the case this year so far as I know. So snow is accumulating over there as you see in the web cams. Wind scours a lot of places over there. Man, I would never want to be caught out over there in the winter. It's been very windy on the east side for what seems like forever. This morning is an exception as I was able to stand outside with my morning coffee and saw no white caps in my cup. Winds some days last week hit 77 mph in East Glacier and Browning. It was even higher in some "favored" locations south of East Glacier (Deep Creek Raws site). It's been fairly warm as well. 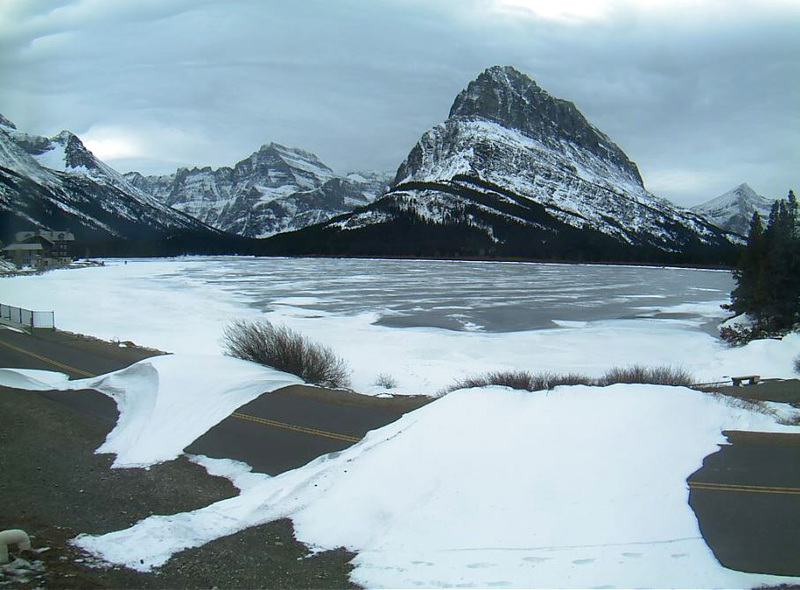 Highs near Choteau have been in the 40s and the ice on Eureka Reservoir has broken open. Caused partly by the warmth but also by the high winds. Winter Storm Watch was just posted for above 5,000 feet for Tuesday, Tuesday night. That might help mountain snowpack. But it'll probably raise heck with my drive to West Yellowstone on Tuesday. We have 5"-6" of snow on the ground here west of Whitefish at just under 3700'. In fact, there have been a few inches on the ground since early November. The spot forecast for early tomorrow is another 2"-4", although right now there is more of a mist in the air and it smells like spring with temps in the mid 30's. I was looking at photos from last year at this time and we have more snow on the ground this year. That changed on 12/19 of last year when we received quite a bit of snow and it just piled up from there. It will be interesting to see what this winter has in store for us.